We might smile at the old song about a rusty Chevrolet, but when your car gets dented and damaged, you want to get it fixed as quickly as possible. If dents and dings are your only problem, though, taking your vehicle to a body shop isn’t the best course of action. 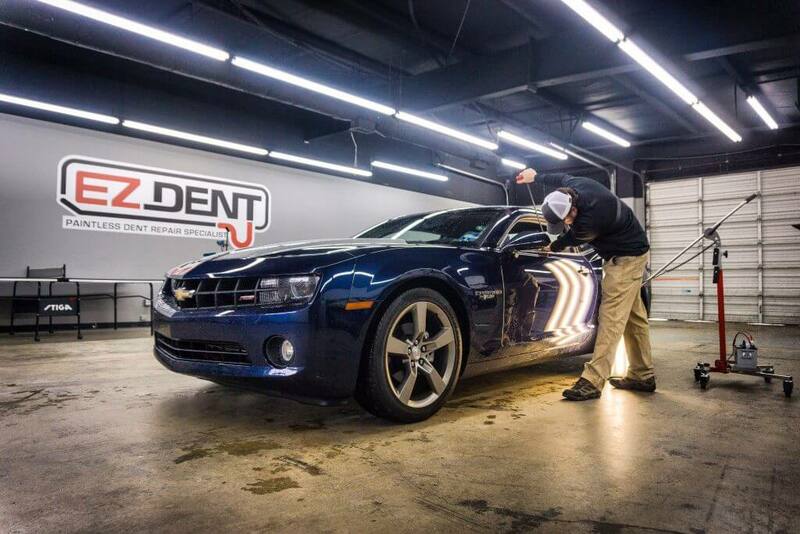 EZ Dent is a specialist in a Paintless Dent Repair process that allows us to fix your vehicle faster and more affordably than taking it in to a traditional body shop. By using special tools, we remove the damaged piece and get the metal back into place from the inside. This allows us to avoid damaging the exterior and protect your vehicle’s paint job. This is the same technique that many dealers use for their inventory while it’s still on their lots. That depends on the size and number of dents, but most repairs are well under what your insurance deductible would be. We don’t need to run a complex repair shop, so we can pass the savings straight on to you. How fast will my Chevy be fixed? The majority of repair jobs are completed in one hour or less. We can’t promise anything until we see what repairs you need, but unless you have a lot of dents, this is the most likely timetable. *Disclaimer – EZ Dent is not affiliated with Chevrolet or authorized Chevrolet dealerships. For more information, or to schedule a repair for your Chevrolet, contact EZ Dent today.